Debunking the common misconception that intuitive eating is eating whatever you want, whenever you want! 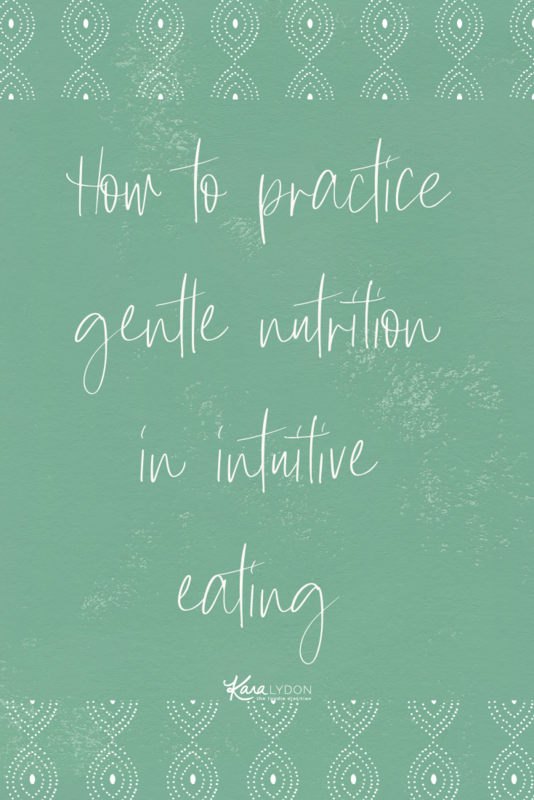 Explaining how to practice gentle nutrition, the last principle of intuitive eating. 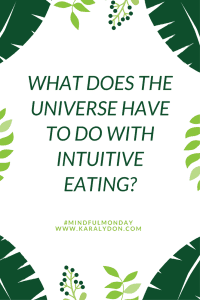 When talking about intuitive eating, one of the most common questions I get is, “but what about health?” Somewhere along the way intuitive eating has been misconstrued to be an eat whatever you want free for all! Perhaps it’s the countless pictures on Instagram of burgers and cookies posted by intuitive eaters, maybe it’s the initial line of defense by someone who isn’t ready to leave diet culture or willing to examine its negative ramifications. Whatever the reason may be, the bottom line is intuitive eating can easily be misunderstood. Intuitive eating is a scientifically-studied paradigm that is rooted in health and helping you heal your relationship with food. Studies have shown that intuitive eating is associated with decreased disordered eating behaviors, improved self-esteem, body satisfaction, depression, anxiety, and general well being, as well as improved biomarkers like cholesterol and blood pressure. So not only does intuitive eating have an impact on your physical health, it also can significantly improve your mental and emotional health. Nutrition is an important aspect of intuitive eating. I mean the book was written by two dietitians. Of course, nutrition matters. But so do all the other 9 principles in the book like satisfaction, rejecting diet culture, respecting your body, honoring hunger and fullness, and so on. In that sense, intuitive eating kind of puts nutrition in its place. Nutrition is an important aspect of health but it’s certainly by no means the most important. You might be wondering why is the last principle referred to as gentle nutrition? And how does that differentiate from nutrition? Because with intuitive eating, nutrition is not rigid, restrictive or extreme. It’s gentle, meaning it’s flexible, fluid, permissive, forgiving, and balanced. With diet culture, nutrition is pretty black-and-white – there are lots of food rules that if broken can elicit strong feelings of guilt and shame. With gentle nutrition, there are flexible guidelines and you get to choose what works best for you. WHY IS GENTLE NUTRITION THE LAST PRINCIPLE OF THE BOOK? It’s no coincidence that gentle nutrition is the last (10th) principle of intuitive eating. This was an intentional move by the authors of Intuitive Eating, Evelyn Tribole and Elyse Resch because it’s important that one has truly made peace with food before practicing gentle nutrition. This is because it is so easy to turn intuitive eating into a diet. You can easily apply black-and-white, rigid thinking to the principles of intuitive eating like I must only eat when I’m hungry and I must always stop when I’m full. Or, I must always have a carb, protein and fat at every meal. Or, I must eat vegetables every day of the week. With this type of rigid thinking, there’s no space for flexibility, fluidity, permission, balance or forgiveness. Once you have truly healed your relationship with food – you have full permission to eat all foods with attunement, you’ve taken the morality out of eating and food exists on a more neutral playing field, you’ve moved away from physiological and psychological deprivation – then you can approach nutrition from a place of self-care, not self-control. HOW DO I PRACTICE GENTLE NUTRITION? You get to decide what gentle nutrition looks like to you. But here are some ideas to get your wheels turning and see if any of these resonate with you. Aim for a wide variety of foods. Showing up for your body with a wide variety of foods is one of the best things you can do for your overall health. From a nutritional standpoint, this helps to ensure that you are providing your body with a variety of vitamins, minerals and antioxidants and preventing any nutritional deficiencies, and from a psychological standpoint, eating a variety of foods will help you feel less restricted and deprived and can lead to greater food satisfaction. Speaking of health, I’ve been on a gut health research kick lately and the latest research on the gut microbiome (aka all billions of bacteria that lives in your gut) is showing that the more diverse the diet, the more diverse the gut microbiome, which is important for gut health. One example of how this plays out in my day-to-day is when I’m making food choices on the fly. I’m typically asking myself what I’m in the mood for, what sounds good in the moment, and I’m usually thinking about are there any foods I haven’t been eating much of lately. Like the other day I was grocery shopping and was looking at all the different varieties of citrus fruits and I thought huh, I haven’t been eating a ton of fruit lately and I really love the taste of citrus fruits so I threw a couple different varieties in my cart and moved on. There was no shame or judgment; just a neutral observation and an action that was rooted in health and self-care. So you might say to yourself you know what I haven’t really been eating that many vegetables lately or that many whole grains lately and I know those foods make me feel good so maybe tonight I’ll have brown rice instead of white rice. Notice you’re not saying I must only eat whole grains from now on (because let’s be real, white rice is delicious), you’re just making a choice that ladders up to the principle of variety. Look at the bigger picture. Wellness culture has become so obsessed with nutrition that we’re zooming in on everything at such a micro level that it is making us a little cray cray. We don’t need to evaluate our nutrition and health on a meal-by-meal or day-by-day basis. Our bodies are not robots computing all of the nutrients we consumed at the end of the day and adjusting our health accordingly. One meal. One day. One week. is NOT I repeat is NOT going to make or break your health. 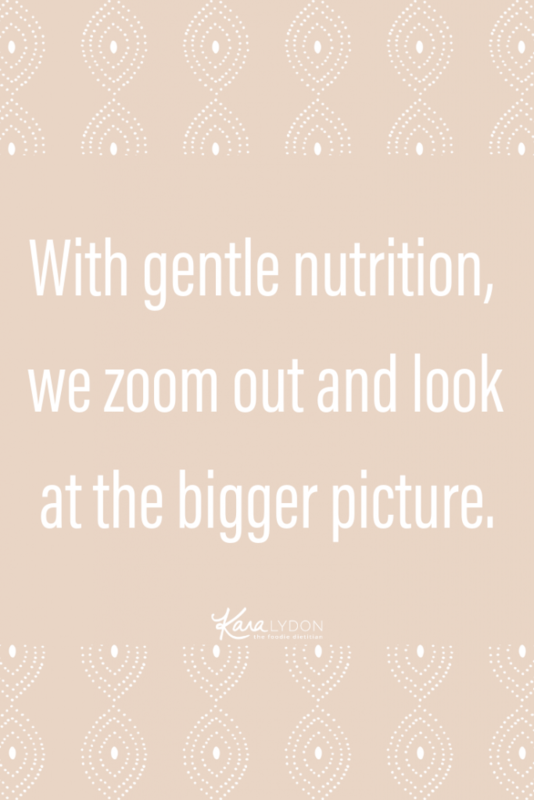 With gentle nutrition, we zoom out and look at the bigger picture. Over the course of a week or month, did you eat a variety of foods from all food groups? In general, are you eating enough? Over the course of a week, are you aiming for a balance of carbs, protein and fat? We don’t need to zoom in when it comes to nutrition. We need to zoom out and take a more balanced, holistic view at our eating and health behaviors. Notice how foods make you feel. Practicing gentle nutrition is not just about noticing what foods sound good but also noticing how foods make you feel. Part of intuitive eating is respecting your body and a lot falls underneath body respect (and that’s a whole other blog post) but under the lens of eating, body respect involves showing up for your body by nourishing it adequately with foods that make you feel good. Now what does that mean to you? Maybe some foods feel better in your body than others. Maybe some foods feel better in your mind and spirit than others. When we talk about feeling good, we want to zoom out and take a holistic view, incorporating mind, body and spirit. And this is something you can evaluate on a case-by-case basis. For example, ice cream doesn’t make me feel good physically. But it sure as hell makes me feel good mentally and emotionally. So I evaluate on a case-by-case basis – is the emotional feel good response worth having bloating and some gas? Sometimes it will definitely be worth it (i.e. stopping at my fave stand during the summer after a day at the beach) and other times it won’t be (i.e. before going out to dinner with friends or before a work event). There are other foods where I know if I have a little bit I feel ok but if I have a lot, I won’t feel as good. This is a process of getting to know your own body and being flexible with it changing. The warning here is that if you are steeped in disordered eating or diet culture, and morality is so tightly wrapped up in your food choices, it can be very challenging to differentiate between what truly doesn’t make you feel good vs. what you think doesn’t make you feel good because of the impurity you’ve attached to it. This is pretty complicated and worth unpacking with an intuitive eating dietitian if this resonates with you. Aim for balance. When it comes to balance, I often talk about a balance of macronutrients – carbs, protein and fat. When I work with clients on intuitive eating and we’re practicing gentle structure to make sure they’re getting adequate nutrition, we’re often talking about this balance – aiming for a carb, protein and fat source at most meals. This balance helps with energy levels, satiety, and satisfaction. But again this is a guideline, not something you have to follow at 100% of your meals. Because the reality is some meals aren’t going to include all three and that’s okay. Self-care, not self-control. 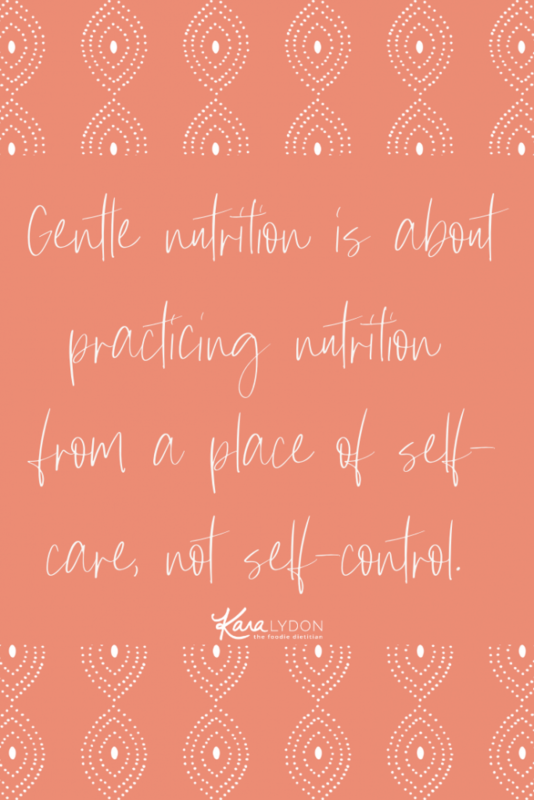 Gentle nutrition is about practicing nutrition from a place of self-care, not self-control. Eat the salad because it makes you feel good and you want to nourish your body with things that make you feel good. Don’t eat the salad because you’re hoping it will help you lose weight or because someone shamed you into eating it (looking at you, J.Lo). Aim for a variety of foods because you care about your body and your health, not because you think you “should.” If practicing nutrition principles becomes rigid and the control you’re exerting is what’s making you feel good, it’s time to re-evaluate because that’s not the essence of gentle nutrition. Do my behaviors feel balanced, permissive, fluid and expansive, or do they feel rigid, restrictive, controlling and extreme? If I veer from the nutrition guidelines, do I feel extreme guilt or shame? If there was no chance these behaviors would help me lose weight, would I still engage in them? Hopefully these prompts will help give you more data about the intention behind your nutrition choices. Remember that gentle nutrition is not a one-size-fits-all-approach. You get to decide what gentle nutrition looks like for you. And again if this is feeling challenging, know that you are not alone (that’s why it’s the last principle in the book!). It’s a highly nuanced topic and if you want to unpack it further with someone, feel free to check out my virtual coaching services or search for an intuitive eating dietitian in your area. Tell me, what does gentle nutrition look like for you? For more Intuitive Eating inspiration, check out my previous posts below! 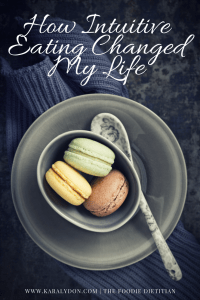 What Do Intuitive Eating and The Universe Have in Common? Love this! Many people think IE can be a free for all and “giving up” on health or wellness goals. I especially love how to ID self care vs self control. Awesome post, Kara! Sharing everywhere!